Oscar-nominated and Emmy-winning US actor Jack Warden has died, aged 85. He died in a New York hospital after several weeks of poor health, including heart and kidney problems, said the actor's business manager Sidney Pazoff. Warden was nominated for Oscars for Shampoo and Heaven Can Wait, and won an Emmy for the 1971 TV film Brian's Song. He was twice Emmy-nominated for the 1980s television series Crazy Like a Fox. 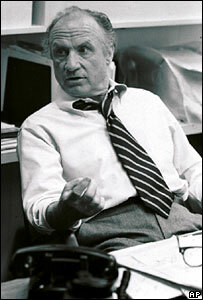 His other films included 12 Angry Men and All The President's Men. Warden was born John Lebzelter in Newark, New Jersey, in 1920. He had a brief career as a professional boxer, and was a paratrooper during World War II, before turning to acting after the war. By the early 1950s he had regular TV and theatre work, and cameos in films including From Here to Eternity. His breakthrough movie role was alongside Henry Fonda and Lee J Cobb in the acclaimed trial drama 12 Angry Men in 1957. He went on to enjoy a prolific TV and film career, with big screen highlights including The Verdict, Bullets Over Broadway and Things to Do in Denver When You're Dead. His last film role was in The Replacements in 2000. Pazoff described Warden as "very gentle, very dapper". He had retired from acting and suffered medical problems in recent years, the manager said.